Venoco, Inc. first proposed the “Paredon Oil & Gas Drilling Project” in 2001. The Project would necessitate construction of a 175′-tall (think Statue of Liberty-size) drilling rig and equipment in an area bounded by City Hall, the Arbol Verde neighborhood, the Bluffs preserve, and Carpinteria’s harbor seal haul-out and sanctuary. The project’s environmental review process identified more than ten significant and unavoidable impacts including threats to public safety, degradation of air and water quality, interference with recreation and public access, and the risk of an oil spill and/or gas leak. Realizing the hurdles ahead, Venoco decided to circumvent the normal planning process by submitting a ballot initiative to the voters in Carpinteria. 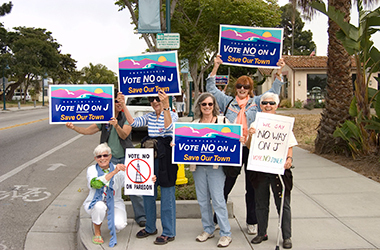 Despite the grassroots opposition – led by EDC and our clients – being massively outspent by the corporate oil interests, that initiative – Measure J – was obliterated on June 8, 2010, when voters rejected Venoco’s proposal by an almost 3-1 margin. Venoco’s application fell into administrative limbo for many years. However, in 2014, Venoco submitted a revised plan to drill more than 20 oil wells on and off the coast in the same location. The City of Carpinteria deemed Venoco’s application complete but the fall in oil prices in early 2015 spurred Venoco to put the project on hold. Of course, there is a strong likelihood that this project will come back, thus reinitiating the environmental review process. EDC and our clients will continue to oppose this project. We are also advocating for policies that would permanently protect the coast of Carpinteria from this type of dangerous industrial development.